The top panoramic view was the view from the roof of Bet Shmuel in Jerusalem, where the service was held. 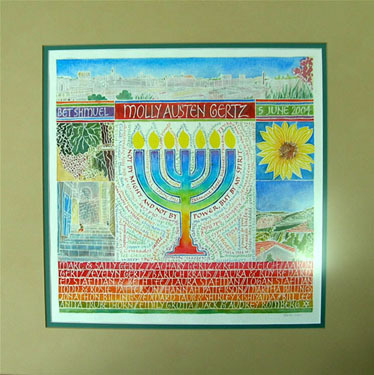 Four other views from the trip are shown on the sides, and the center menorah honors the state of Israel and the Bible verse associated with it. Names of fellow travelers listed at bottom, and places we visited listed around the menorah. Watercolor, gouache, colored pencils. All the white lines were masked until the piece was finished.